While most of the country is already turned on their heaters and brought out their winter jackets, we’ve been suffering from the unbearable heat with 10,254% humidity until just a few days ago. I envy those of you in cooler states, you get to snuggle under a fuzzy blanket and drink hot chocolate with the mug cradled in your palms for warmth. Of course, the grass is always greener on the other side, right? First, a little about where this recipe came from. 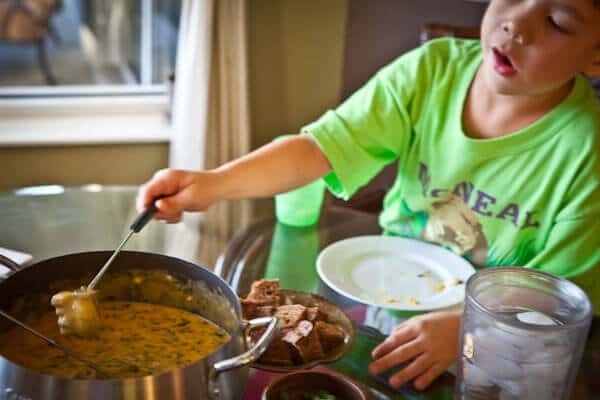 I recently hosted a recipe contest with Pacific Natural Foods where 2 winners got an all-expense paid trip to culinary boot camp at the Culinary Institute of America in Napa Valley. 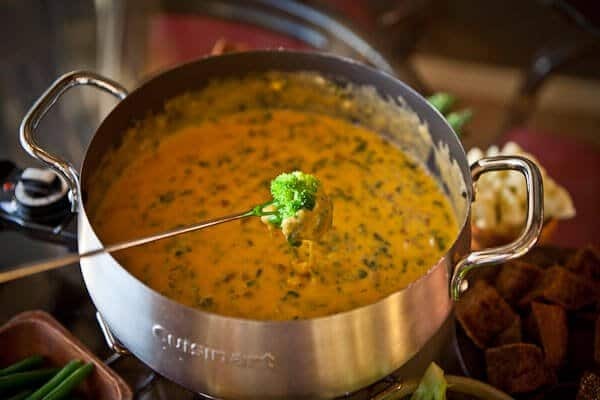 Lucky winners, Michael Natkin of Herbavoracious and Virginia Slim scored the trips — and I got to choose the “Jaden’s Pick” winner, which was this Spinach and Mushroom Fondue by One Spicy Dish blogger, Holly. I stayed pretty true to her recipe…except for one thing. Would you expect anything less from me? 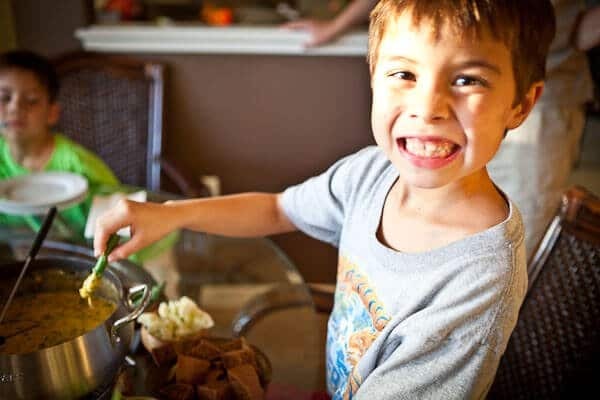 ….dunked in the fondue up by happy kid number 1…. …and apple chunks, my personal favorite. 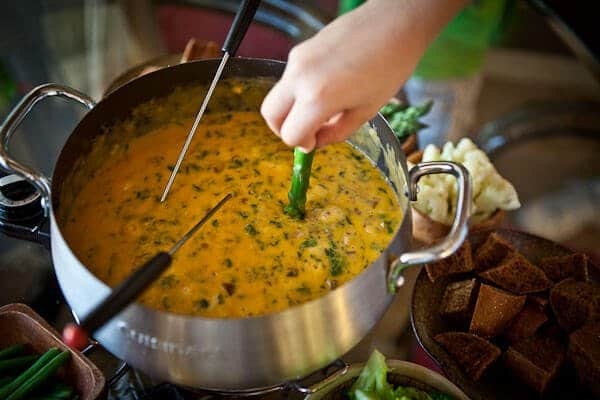 Spinach and Mushroom Fondue by One Spicy Dish blog. 1. Prepare the dipping foods by bringing the chicken stock to a boil in a sauce pot. Add the broccoli, cauliflower, asparagus and green beans and cook for 2 minutes. Using a slotted spoon, strain out the vegetables, reserving the broth. You will use 1/4 cup of this reserved broth in the fondue, but save the rest for another use. 2. 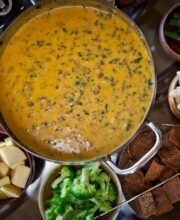 In a large bowl, toss together the shredded cheddar, shredded gouda and the flour until flour is coating cheese evenly. Set aside. 3. Take the thawed chopped spinach in your hand and squeeze as much water as you can out of the spinach. Set aside. 4. Heat a fondue pot or medium pot over medium heat with the butter and bacon. Cook the bacon for 2 minutes (make sure the bacon does not burn or cook too quickly). Add the garlic and mushrooms and saute until the mushrooms are softened, about 2 minutes. Pour in wine and 1/4 cup of the previously reserved chicken broth from step 1. Bring to a simmer and in batches, add a handful of the cheese, stirring and letting the cheese melt before adding more. Stir in the chopped spinach. 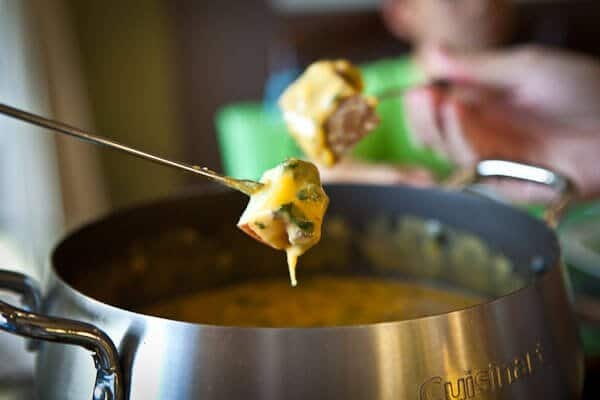 If the fondue becomes too thick, add a couple tablespoons of additional broth. 5. 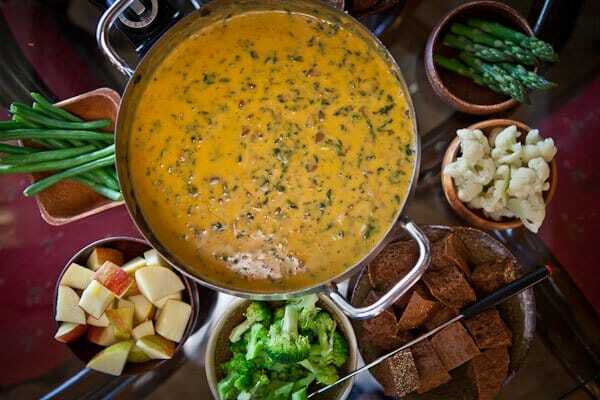 Serve fondue with the vegetables, apples and bread. 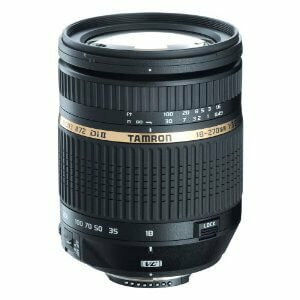 pssst….don’t forget, I’m giving away a Tamron lens!